Maroon 5 is a well known US pop rock band hailing from Los Angeles. 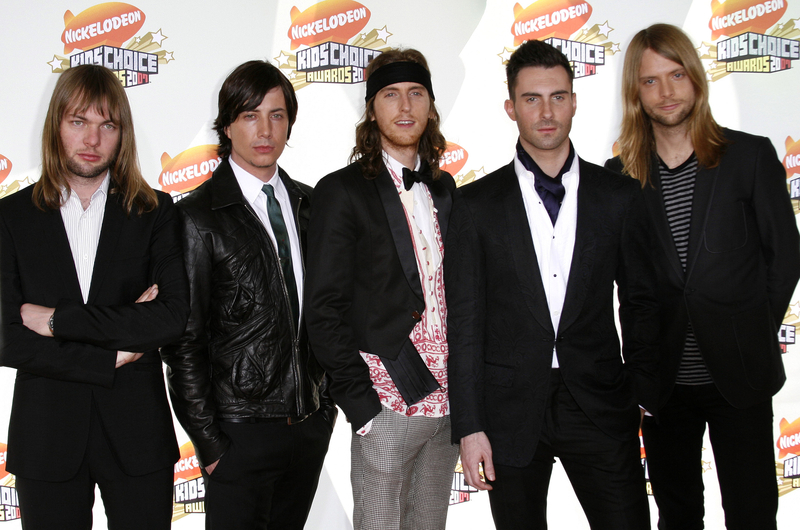 At present, it comprises of five members and they include P J Morton, Matt Flynn, James Valentine, Mickey Madden, Jesse Carmichael and Adam Levine. Prior to establishing this current group, four people of this group except P J Morton came together to create a band called Kara' s Flowers in 1994. When they constituted this band, they were high school students. In 2011, other members joined the group and Ryan Dusick parted his ways after a few years. In the same year, they entered into an agreement with Octone Records and came out with their first album titled 'Songs about Jane'. The most prominent single of the album, 'Harder to Breathe' reached at the 6th position on the Billboard 200 chart. In 2004, it was declared as platinum and the album was chosen as the 'Sleeper Hit of the Millennium'. This band received the Grammy Awards in 2005 for for the Best New Artist. Immediately after that, Maroon 5 conducted a world tour for the next few years to promote the album and two live recordings called 'Live -Friday the 13th' and '1.22.03 Acoustic'. The second album titled 'It Won't Be Soon Before Long' came out in 2007 and this album reached the number one spot in the US Billboard 200 chart. The best single in the album titled 'Makes Me Wonder' became the topper in the Billboard Hot 100. Maroon 5 released their third album called 'Hands All Over' in 2010 and they re-released this album in 2012 by including the single titled 'Moves Like Jagger'. This single topped Billboard top 100. In 2012, fourth album 'Overexposed' containing four singles was released and all the four songs featured in the Billboard Hot 100 chart. In 2014, Maroon 5 entered into an agreement with Interscope Records and released their fifth album called ' V'. They created history with this album because more than 20 million copies of this albums has been sold. Additionally, 70 million singles from this album were sold all around the world as well. Find out Maroon 5 lyrics you love and enjoy! ● coursing through my veins co..
● new phone who is dis eating ..
● leron leron sinta lyrics) bi..
● money over everything oooh o..
● they say its money over ever..
● i give you praise by sinach ..
● joys of love ( something in ..
● where has the time gone jaco..
● heaven declare your rule and..
● you aint got no clue what i ..
● everything is blessed by joe..
● jesus brought me out anthon..
● joe praise latest songs and ..
● early in the morning the sun..
● superman chris shalom song l..
● hey mister sun wont you shin..
● hey mister sun shine down on..
● have you ever had that feeli..
● dying slowly listening to th..
● do we hold on or let go do w..
● i heard voices in my head ra..
● ukuthand umntu olothando nda..
● ano ang nagawa by jaykay lyr..
● let your annointing fall on ..
● sefapanong ke bohong lebo se..
● joyous celebration vol 20 tr..
● sali dumay original by grace..
● brenda fassie hello my sweet..
● two timer spoken poetry taga..
● imma have you screaming oh y..
● i want to get paid like rico..
● ntokozo mbambo ngcwele uyi..
● safe in your arms again dr. ..
● hayaan mo sila by exbattalio..
● pressure busspipe grown man ..